Stickers and iron-on patches with a summer theme. Product Description: Sticker (patch) with an embroidery of a man windsurfing.Content: 1 iron-on stickers.Dimensions: 43x40 mm.Material: Textile. Product Description: Sticker (patch) with an embroidery of a windsurfing table.Content: 1 iron-on stickers.Dimensions: 18x23 mm.Material: Textile. Product Description: Sticker (patch) with an embroidery of towel and umbrella for the beach.Content: 1 iron-on stickers.Dimensions: 22x24 mmMaterial: Textile. Product Description: Sticker (patch) with an embroidery of a crab with sequins.Content: 1 iron-on stickers.Dimensions: 40x62 mmMaterial: Textile. Product Description: Sticker (patch) with an embroidery of a camping tent.Content: 1 iron-on stickers.Dimensions: 35x55 mmMaterial: Textile. Product Description: Sticker (patch) with an embroidery of a backpack.Content: 1 iron-on stickers.Dimensions: 45x45 mmMaterial: Textile. Product Description: Sticker (patch) with an embroidery of beach flip flops.Content: 1 iron-on stickers.Dimensions: 20x20 mmMaterial: Textile. Product Description: Sticker with a design of a little sailboat. Content: 1 iron-on sticker. Maximum Length: 45 mm. Material: Textile. 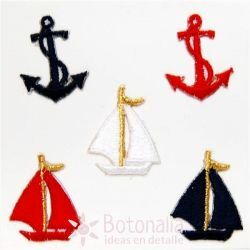 Product Description: Sticker with a design of a sailboat.Content: 1 iron-on sticker.Maximum Length: 46 mm.Material: Textile. 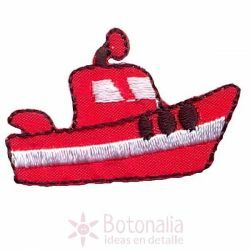 Product Description: Sticker with a design of a motorboat.Content: 1 iron-on sticker.Maximum Length: 41 mm.Material: Textile.